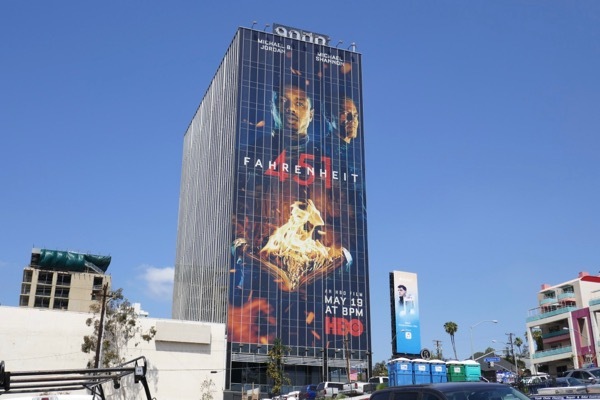 Daily Billboard has a confession, you may have noticed reading this blog that we're not the biggest fans of remakes and reboots, but in today's political climate in America you can see exactly why HBO has remade the classic, Fahrenheit 451. 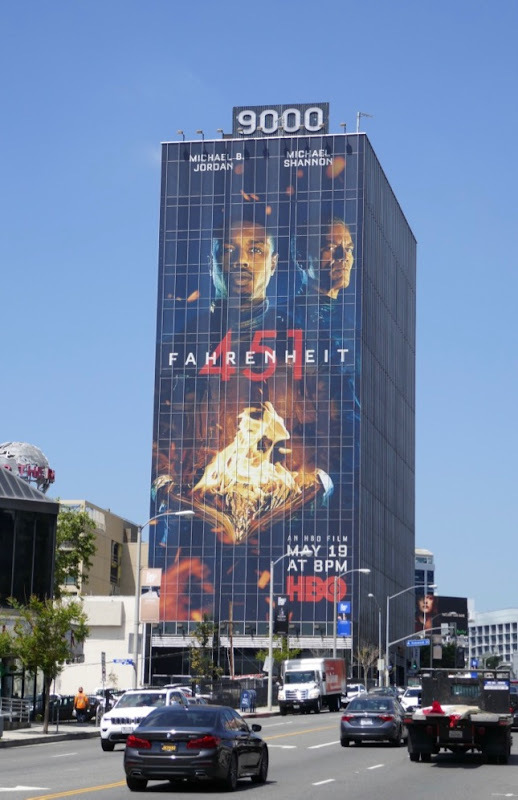 Based on the dystopian novel by Ray Bradbury from 1953 (and François Truffaut's 1966 cinematic adaptation), this new 2018 version imagines a future where books are illegal and so-called 'firemen' have the responsibility of burning these banned books. 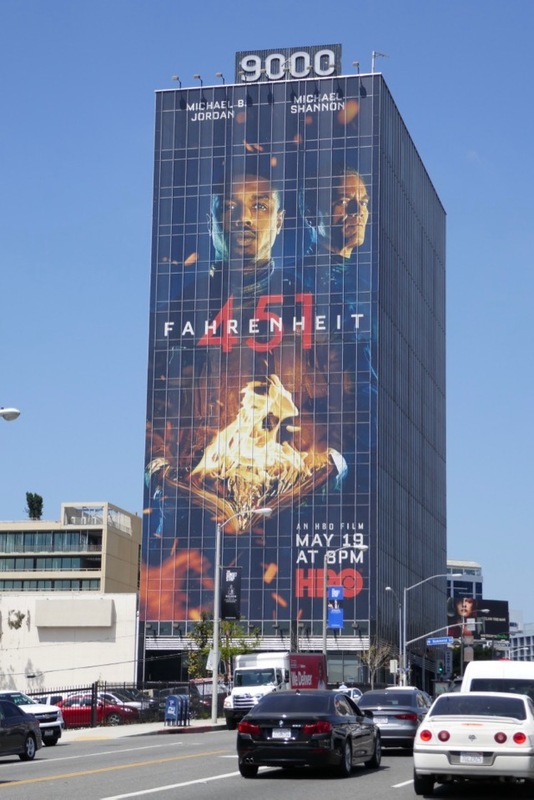 Fahrenheit 451 is the temperature at which these outlawed books burn. 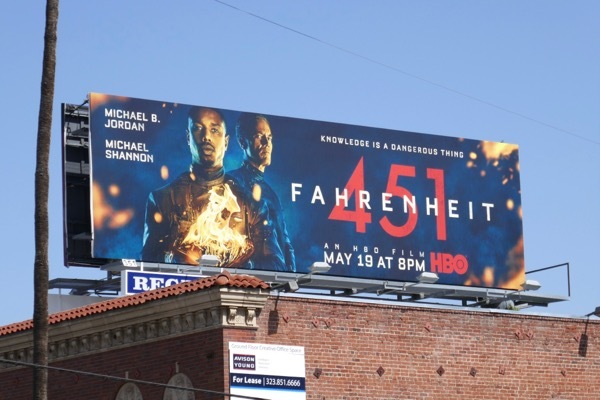 Fortunately the HBO remake also has the advantage of starring some of Hollywood's hottest stars, with Michael B. Jordan coming off a stellar performance as 'Erik Killmonger' in Black Panther and Michael Shannon fresh from sci-fi and fantasy films like The Shape of Water and Midnight Special. 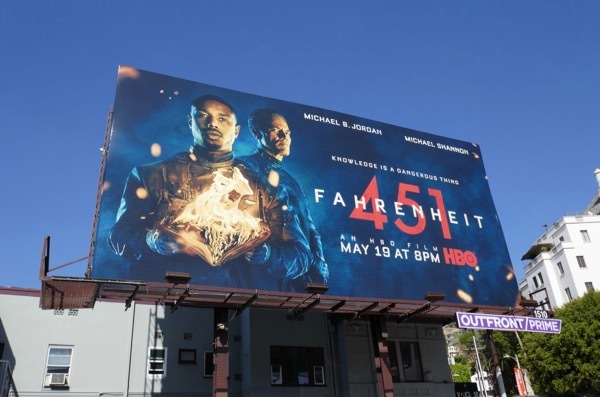 Michael B. Jordan plays 'Guy Montag' who is happy to go about his work destroying these books until someone causes him to reevaluate his actions and convictions, whilst Michael Shannon plays his law-abiding surrogate father and captain. 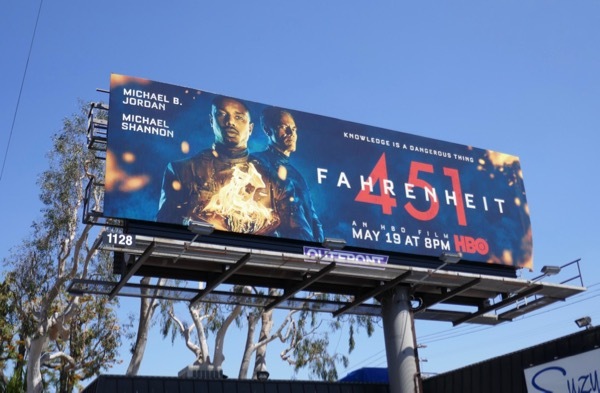 These movie billboards were snapped along Sunset Boulevard and 3rd Street from May 11 to May 17, 2018. 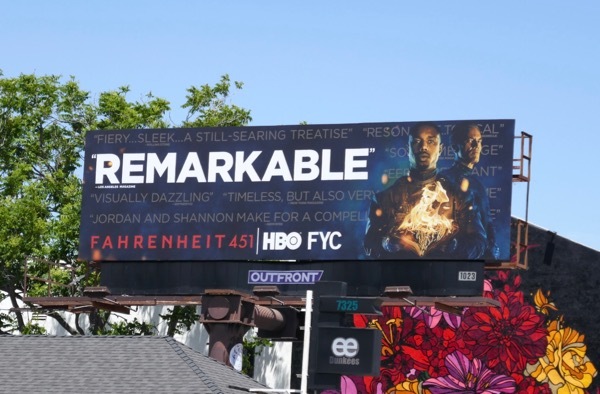 Fans of the actor can also enjoy these Fantastic 4 movie billboards from 2015 and these film billboards for That Awkward Moment from 2014. 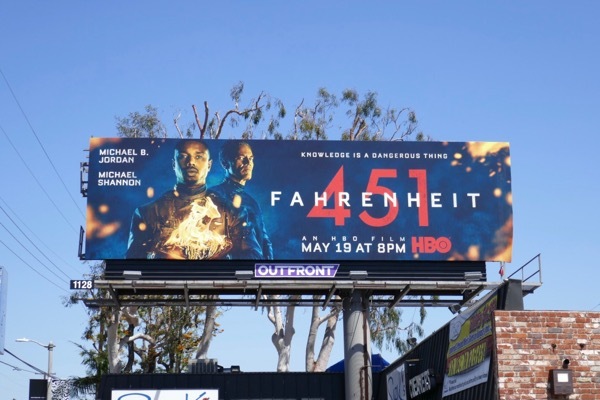 This film has never been more timely when fake news and lies are peddled as truth by the government, scientists and scientific facts are ignored in favour of greed and profits, access to the internet is for only those who can afford it, and young children and the poorest in society are denied a proper education in order to make them as dumb, disadvantaged and unquestioning as possible. A world without books, be they paper or electronic, would be a sad place indeed. 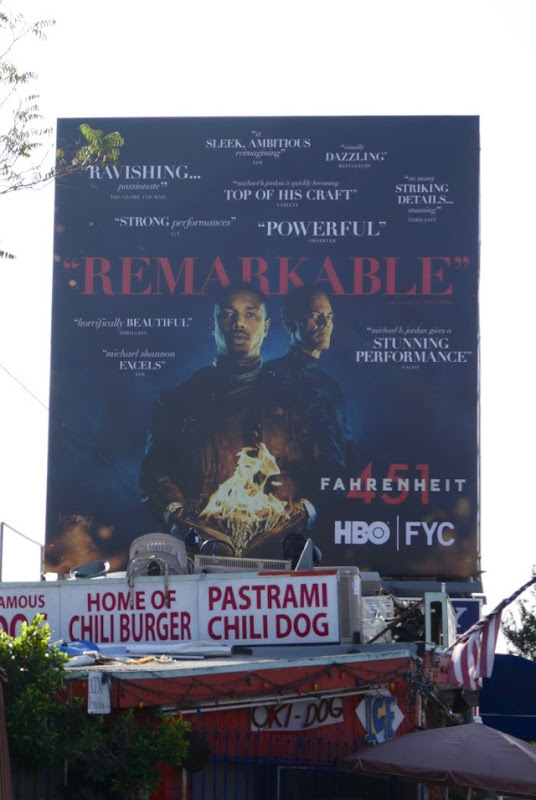 UPDATED: Here's also an Emmy consideration billboard for this 'Remarkable' HBO adaptation spotted along Melrose Avenue on June 15, 2018. 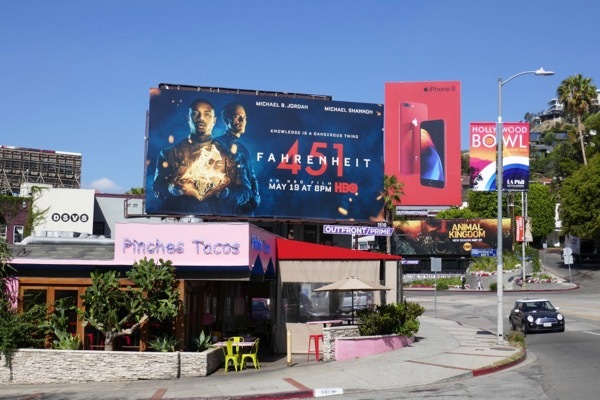 UPDATED: Here's also a billboard for the winter awards season spotted along Fairfax Avenue on November 20, 2018.